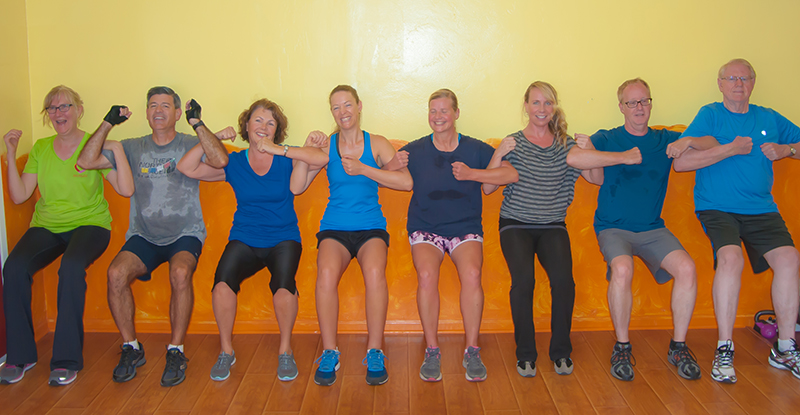 We strive to provide our neighborhood with an interactive, motivating place to practice functional fitness techniques that promote living a strong, healthy life in an atmosphere of comfort, familiarity, and the freedom to get fit your way. Whether you like to workout alone, with a group, or with an instructor, Get Fit on Adams has an option for you! We also offer a variety of small group classes that you can join to supplement your fitness regime. The classes will vary depending on the current instructors. A well-rounded fitness program encompasses all aspects: strength training, flexibility, cardio and balance. To be functionally fit you need to include all of these elements and Get Fit on Adams has what you need. A "Functional Fitness Facility" is a place that is equipped with everything needed to get a dynamic, full-body, functional workout. This facility will not be equipped with certain equipment that a typical gym might have, such as single-purpose machines (ie. leg extension machine, bicep curl machine, squat machines or chest press benches with bars.) What it will have is BOSU Balls, Dyna-Discs, resistance bands, medicine balls, cardio machines that work the whole body, mirrors to watch alignment, and ample space to stretch. If you typically workout at weird hours of the day like crazy early, or late into the night, we are your kind of place! Or, maybe you hate big gyms and just want some quiet when you work out, but you don't have the space to keep equipment in your house. Perhaps you live close by and you would enjoy having a local place to practice dance, martial arts or yoga on your own. Our fitness center and our unique approach to fitness is also well-suited to those who are recently transitioning out of a physical rehabilitation program but who still need to have a place to go in order to keep it up on their own. Even if you already have a full-spectrum fitness program of your own, and you just need a functional place to exercise, then you will benefit from what our facility has to offer!